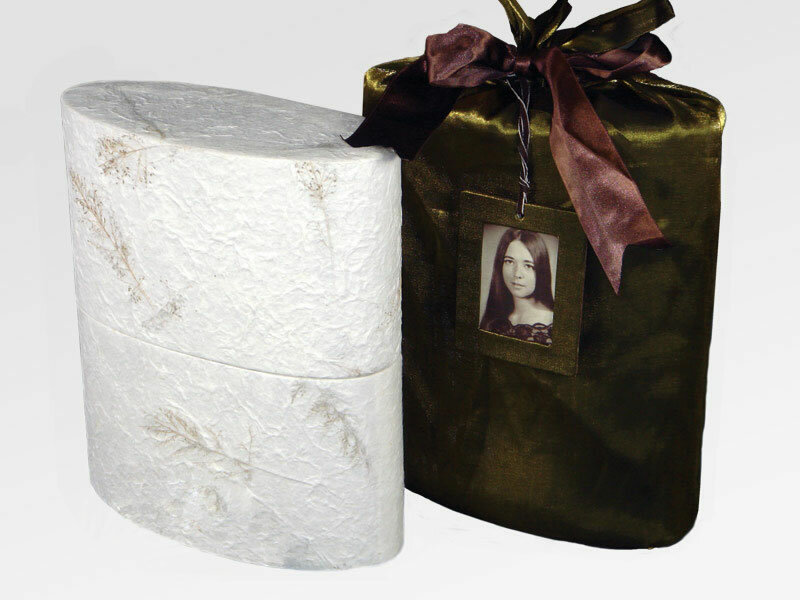 The Reflection Biodegradable Urn features a simple yet elegant oval shape biodegradable urn crafted of handmade paper made from sustainably harvested mulberry tree bark and infused with leaves and flower petals. A silk bag with ribbon and matching picture frame is included for transport, ceremony, or storage. This urn is suitable for scattering or biodegradable burial. The silk bag and frame can be retained to store personal mementos once the urn is buried or the cremains have been scattered. The picture frame accommodates a 2.75″ x 2″ photograph. Click on Detailed Images for a larger view of the interior urn and the silk bag. If kept inside in a dry environment, this urn will last for decades.